Therefore the dates for these holidays are fixed from year to year. If the date of a holiday or festival occurs on the weekend, the next working day will be observed as a compensatory non-workday (Thailand, nd). Along with public holidays that are observed by the national government, individual districts, villages, and religious groups may have unique celebrations. Most of the festivals in Thailand are for spending time with your family and showing appreciation for others, such as Children’s Day which is celebrated January 9th (Thailand, nd). Two popular festivals are the Rocket Festival (Bun Bangfai) and the Water Festival (Songkran). Bun Bangfai is celebrated throughout the region of Isaan (Northeast, nd). Isaan is a northeast region of Thailand. This region is home to nearly a third of Thailand’s population. 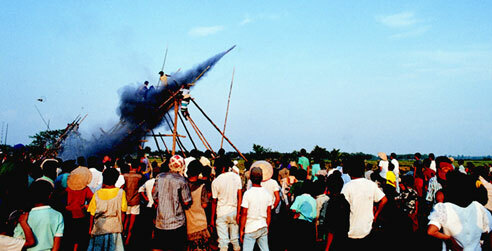 The main province this festival takes place is the Yasothon province, but rockets will be launched from places throughout the region (Northeast, nd). Every year during the month of May, rockets are crafted to launch brilliant fireworks in order to encourage the gods to bring rain. The rockets are decorated and paraded throughout the town before they are launched. May is the beginning of the rainy season in Thailand (Thailand, nd). The day of this event changes from year to year because it follows the lunar calendar. However, in Yasothon, they celebrate the event over the Friday, Saturday, and Sunday in the middle of May (“Rocket Festival”, 2014). At the end of the weekend, there is a competition to see whose rocket travel farther or higher. If a person’s rocket misfires, they get covered with mud (Thailand, nd). While this festival is a lot of fun, it can be dangerous. There have been instances of injuries happening from rockets exploding too early (‘Rocket Festival”, 2014). Celebrating the New Year in April instead of January was originally adopted from the ancient Brahmins of India. The Brahmins believed the passing of the moon, sun and other planets into the zodiac sign of Aries to be the start of a new astrological year or ”Songkran”. The actual word “Songkran” originates from the Sanskrit word (Sankranti) for change or to move and the Pali word “Sankhara”. The original date of this new year was originally calculated astrologically but over time was changed to the set date of April 13th. The Songkran Festival has been one of the most important holidays of the year for the people of Thailand for many years. During the 13th century the festival involved citizens drinking an oath of allegiance to pay homage to the royal family and the government. During the Ayutthaya period (1350-1767), people celebrated the holiday by bathing images of the Buddha for good luck, and by building sand pagodas at local temples. Over time it became tradition to sprinkle water on one another in order to share blessings. Elders would also have scented water poured over their hands as a gesture of reverence. 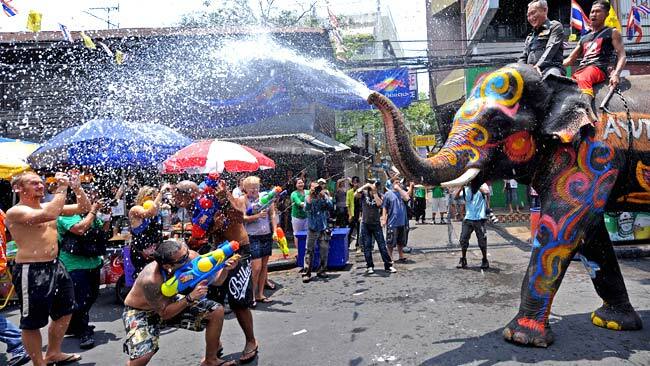 Today the festival is celebrated throughout Thailand with huge water fights. Vendors line the streets selling small water guns and buckets to be used in the water fights. 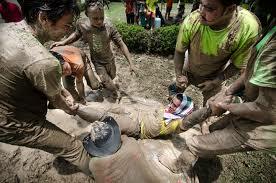 Along with the water fights there are many other traditions that go with the Songkran Festival. It is also very common for people to tie strings around the wrists of others to express good wishes for the New Year. While tying the string the person usually recites blessings and prayers for the person receiving the string. The strings are supposed to be left on until they fall off naturally and it is not uncommon for people to end up with upwards of thirty strings per wrist. Another popular tradition of the festival involves spreading a white powder or paste on parts of the neck, face, and torso of others. This paste is supposed to ward off the devil and protect the recipient. The Songkran festival is also made up of many other traditions that signify the coming of the New Year. 1. “Rocket Festival.” Wikipedia. Wikimedia Foundation, 14 Feb. 2014. Web. 14 Apr. 2014. <http://en.wikipedia.org/wiki/Rocket_Festival&gt;. 2. “Songkran (Thailand).” Wikipedia. Wikimedia Foundation, 29 Apr. 2014. Web. 2 May 2014. <http://en.wikipedia.org/wiki/Songkran_(Thailand)>. 3. “Thailand Calendar Festivals, Holidays, Events.” Mundo Exchange Community Development Volunteer, Donations and Internships. N.p., n.d. Web. 15 Apr. 2014. <http://mundoexchange.org/2010/10/thailand-calendar-festivals-holidays-events/&gt;. 4. “Thailand Water Festival – All About Songkran in Thailand.” About.com Asia Travel. N.p., n.d. Web. 2 May 2014. <http://goasia.about.com/od/Events-and-Holidays/a/Thailand-Water-Festival.htm&gt;. 5. “The Northeast: Isaan Guide | Thailand Travel.” Rough Guides. N.p., n.d. Web. 16 Apr. 2014. <http://www.roughguides.com/destinations/asia/thailand/northeast-isaan/&gt;.